While visiting a client in Amsterdam, I noticed that Europeans have a heightened sense of empathy when it comes to everyday business activities, like scheduling meetings. They don’t have the American time-zone-centric sense of the world. Everyone’s willing to take a turn to sacrifice personal time or sleep when arranging meetings with colleagues around the world. How often do we appreciate the place that others inhabit, not only geographically, but mentally too? This cultural sensitivity is one manifestation of empathy—a requirement for all of us who collaborate on technology projects. Each of us naturally brings a unique perspective and agenda to projects. However, if we lack empathy, we remain concerned only with our own issues. Without empathy, we act as if we’re wearing blinders that prevent us from acknowledging the very real perspectives, challenges, and needs of our colleagues from other departments and vendor partners on the project team. This self-centered attitude leads to friction, miscommunication, and missed opportunities. Without empathy, projects are at risk of derailing and expectations are not likely to be met. An example of this scenario that’s painfully all too common in associations: rogue IT projects. One department pushes ahead blindly with their agenda. They fail to inform or consult with the IT department. Consumed with their brilliant idea, they find technology that will allow them to move forward. It’s only after they sign a contract for the new technology that they tell IT to bolt it onto existing systems. You can imagine the challenges and friction that results. When we’re caught up in our own agendas, we operate with myopic lenses. Instead, we need to broaden our range of vision, and acknowledge that we’re part of a larger whole. We need to see the bigger picture beyond our own agenda. Too many technology projects flounder because of departmental agendas. If you’re in charge of a project, understand the damage that a lack of collective empathy can wreak. When individual/departmental interests take precedence over larger project goals, the results can be devastating—not only leading to an unsuccessful initiative, but possibly also reinforcing existing silos and deepening the gulf between business units. Work backward from that common goal to find common ground. What does success look like? How will we know when we get there? How will we make decisions as a group? What are the roles and responsibilities of each person? You can’t have collective empathy if conflict is simmering under the table. In the nonprofit world, a flawed preconception has taken hold that everyone needs to preserve the political peace. Keep things to yourself, play nice, and go along to get along. Conflict is repressed and ignored. Conflict is feared. Serious issues aren’t addressed. No one wants to bring up the proverbial elephant in the room. As a result, collaboration and projects go off the rails because staff is operating in a land of make-believe. Constructive conflict is necessary for a project’s success—emphasis on constructive. Everyone brings agendas to table—that’s a given. 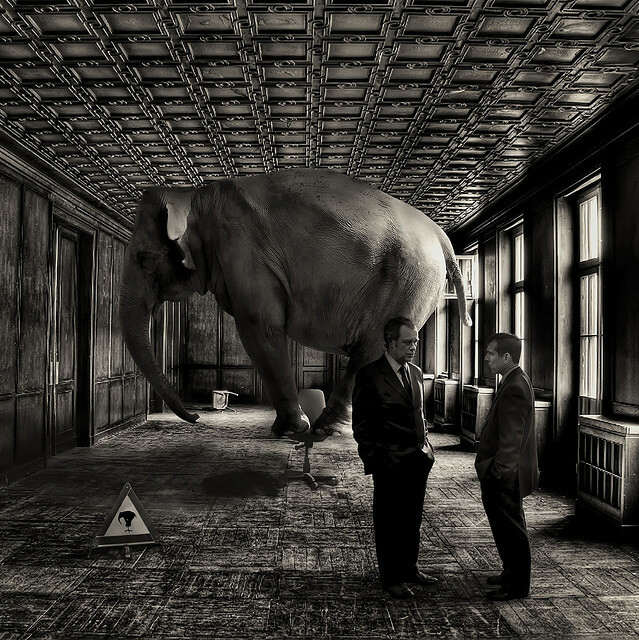 If you don’t address these agendas, have difficult conversations, and make tough business decisions at the beginning of a project, the technology you’re trying to implement won’t solve your problems, and the elephant will remain. When dealing with constructive conflict, empathy is a must. Everyone must leave their comfort zone, keep their own agendas in perspective, drop their blinders, and listen. Encourage everyone to ask questions and to put themselves in each other’s place. See things from a new perspective and understand the bigger picture, the common goal. The path to this progress may feel awkward and uncomfortable, but it’s a necessary step to take. The extent to which a project team can come to the table with a sense of empathy and work through constructive conflict is an indicator of future project success. Flickr photo by David Blackwell.